Whats the best way to find and repair a water leak? Plumbers of Hollywood, are here once again to save your life. They are the leak detector of leak detectors: professional, reliable, friendly and always ready to help. Launching our all-american leak detection service was necessary and needed given the number of water damages we notice every year in every part of the city and the county in general. Water leak detection is our specialty, if you can’t locate a leak, call us now and we will help you out! We pride ourselves on being the best plumbers in the industry since we are having an astonishing 99% success rate at locating hidden pipe leak. Plumbers of Hollywood Florida offer a leak detection service, mainly a non-destructive solution to finding leaks in any pipe work in both residential and business premises. We use specialist equipment coupled with our licensed plumbers and engineers technical expertise to locate hidden leaks quickly and accurately, saving both time and money.Our engineers are on call 24/7 every single day of the year. Occasionally it may not be possible for you or your plumber to locate the source of the leak and can also be due to obstacles such as walls, cupboards and floorboards. This is where leak detection can be extremely helpful as the leak detection equipment is specially designed to find water leaking anywhere in your property without causing any damage. Central heating leaks could be the cause of your boiler losing pressure on a sealed system, this could mean that you may have a hidden leak on your central heating pipe work somewhere in your property. Whatever your heating system, whether it's old or new, our experienced engineer will be able to diagnose if the problem is in the boiler or the pipe work. Hidden leaks can be difficult to find. At Plumbers of Hollywood, our engineers use custom water leak detector to find your leak without causing damage to your property. Our leak detection team has more than 30 years of experience in finding leaks and use various leak detection methods to accurately locate your water leak. 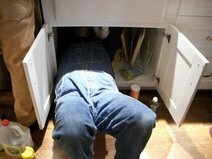 Any excavation will be kept to a minimum when the pipes are repaired. We also do commercial and industrial leak detection in case your office or factory needs help with a water or slab leak. Contact us to get a custom quote based on your requirements and type of property.